The NFL’s Sunday slate of Week 8 games got underway early with the final international game of the season, between the Minnesota Vikings and Cleveland Browns. Despite holding their first lead at halftime this season, the Browns were outmatched in the second half as the Vikings pulled away in the fourth quarter to a 33-16 victory. Vikings QB Case Keenum tossed two touchdowns and Kai Forbath knocked home four field goals in the victory. The Vikings wide receiver duo of Stefon Diggs and Adam Thielen hauled in nine combined receptions for 125 yards between the two of them and RB Jerick McKinnon totaled 122 total yards himself against Cleveland. Browns rookie QB DeShone Kizer and the Browns offense scored on their first possession after a Joe Schobert interception, but couldn’t muster much in terms of sustained offensive success, gaining just 276 total yards on the day. Keenum was unfortunate early on as he saw one of his passes get tipped and then intercepted. However, this did not have an impact on his performance the rest of the game as he patiently picked apart Cleveland’s defense. Minnesota’s quarterback kept his cool under pressure as he had a passer rating of 133.3 when the Browns put him under duress. Furthermore, Keenum did a solid job of taking advantage of Cleveland’s busted coverages downfield as he completed 9 of his 13 passes that traveled at least 10 yards in the air. Even though McKinnon averaged just 3.6 yards on the ground, he had a decent day as he needed to fight for every extra yard as 46 of his 50 rushing yards came after contact. In addition, he forced five of the six missed tackles that the Vikings forced as a team on run plays. 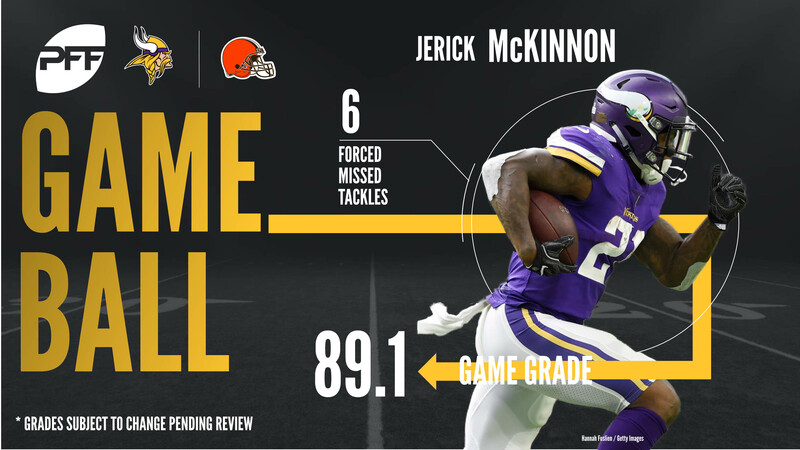 Finally, McKinnon was a threat in the passing game as well since he caught all six of his targets and averaged 11.7 yards after the catch on the day. It was an up and down game for Rhodes, with the long completion allowed in the first half to Ricardo Louis down the left sideline, and a penalty commited. Outside of that though, he allowed just one other completion for three yards, and broke up one of the passes thrown his way. While Waynes wasn’t perfect, missing a tackle early in the game, his physical presense in coverage was key for the Vikings secondary. Targeted seven times in coverage, he allowed just two receptions for 22 yards, breaking one pass up, and forcing another incompletion with heavy contact. Coleman excelled in pass protection for the Browns, avoiding allowing a pressure all game and had some impressive blocks in the running game as well. His zero pressures allowed came on 40 pass blocking snaps, giving him a pass blocking efficiency rating of 100.0. McGill proved to be a problem for Minnesota’s offensive line as he wreaked havoc throughout the afternoon, be it rushing the passer or against the run. Although McGill rushed the passer on just nine occasions, he was able to pick up three total pressures, including a hit. In addition, he was nearly unblockable in the running game seemingly all afternoon. While Nassib picked up just one pressure – a sack – on 31 pass-rushing snaps, he also got the hands on two passes at the line of scrimmage, including one that turned into an interception in the first quarter. In addition, Nassib impressed by setting the edge against runs as he was among the Browns’ highest graded defenders against the run.